Whether you are a grad student, business analyst, statistician, or even a long time user of SAS software- SAS for Dummies (available at Amazon) offers quick access to a vast survey of practical knowledge using the new and exciting world of SAS 9. If you are using the latest version of SAS Learning Edition (version 4.1), this book also makes a perfect companion since it covers SAS Enterprise Guide and the same release of SAS 9. SAS for Dummies is very different from most SAS books since it does not focus on just one topic, such as data management, survival analysis, or SAS programming. Instead, I offer you key points and capabilities for a broad range of areas needed to access your data, manage your data, create reports and summaries, make awesome graphs, and get you started on the path of analytics guru! 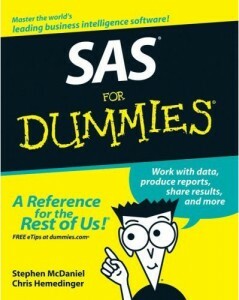 SAS for Dummies Sample Datasets, also included with SAS Enterprise Guide. I have them available here in case you can't locate or simply don't have these sample datasets. You will need to place them in a folder and SAS library accessible to your SAS server or in a folder where you can import them to your SAS Server with Enterprise Guide. Part I: Welcome to SAS! Data, Data Everywhere, Just Not Where I Need It!